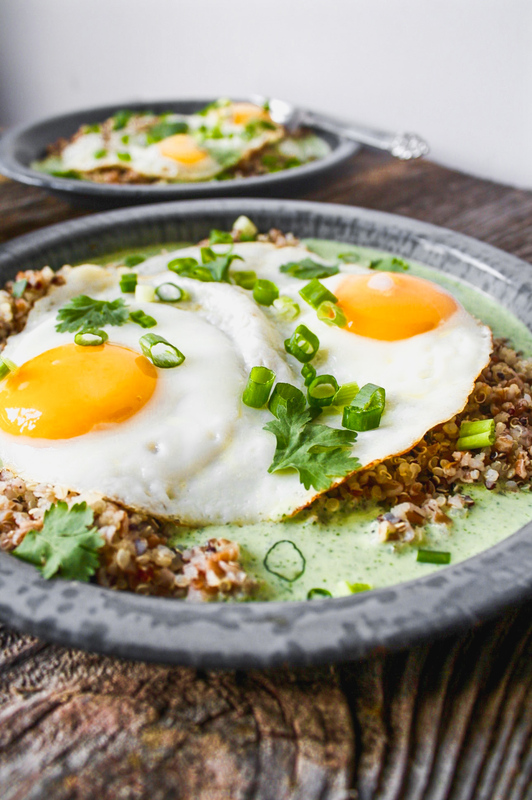 A vibrant cilantro-yogurt sauce creates a flavorful, refreshing base for this healthy breakfast. 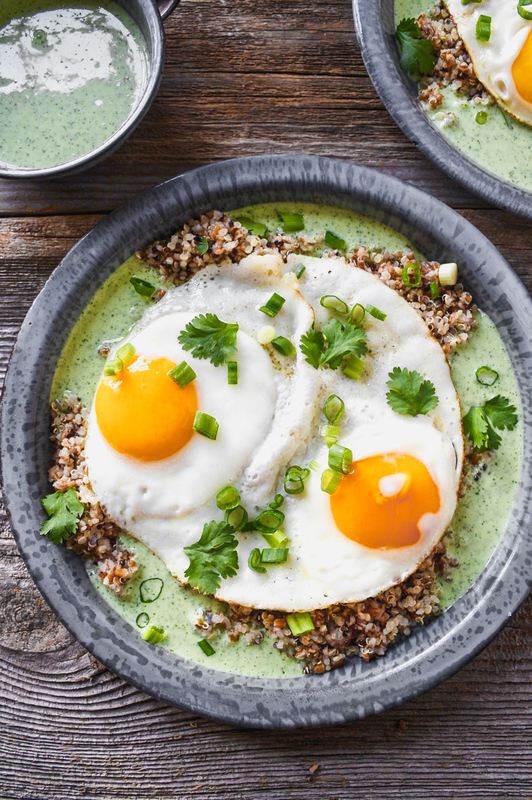 Made with both quinoa and bulgur, then topped with perfectly cooked eggs, this is one wholesome and satisfying breakfast. I came across the most gorgeous image on Instagram a few months ago of a breakfast dish being served up in LA. Winsome, self declared as, “a good place to be”, indeed seems a great place to be any time of the day or week. Their breakfast, brunch, lunch, and dinner menus look amazing (their cocktail list doesn’t seem to be too shabby either). What intrigues me the most about Winsome is that their menus offer a variety of dishes for the likes of any and all customers. Whether you’re a die-hard carnivore (they have braised beef cheek and half roasted chicken) or a vegetarian (vegetable bahn mi and crispy tofu) the options are not limited. Plus, they have a good amount of healthy options to choose from, which I’m always on board with. And let me assure you, this isn’t meant to be a promo post (let’s be honest, Winsome doesn’t know who I am); I simply find their dishes to be refined and unique, yet very familiar. Also, if you’re looking for some mad food photos, check out their Instagram, it’s gorgeous. 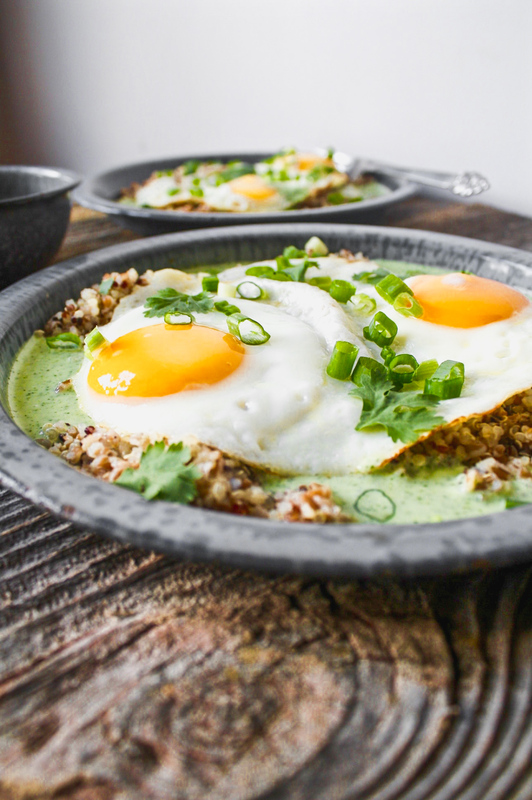 The basis of this recipe was inspired by one of their gorgeous breakfast dishes — Grains and Eggs. 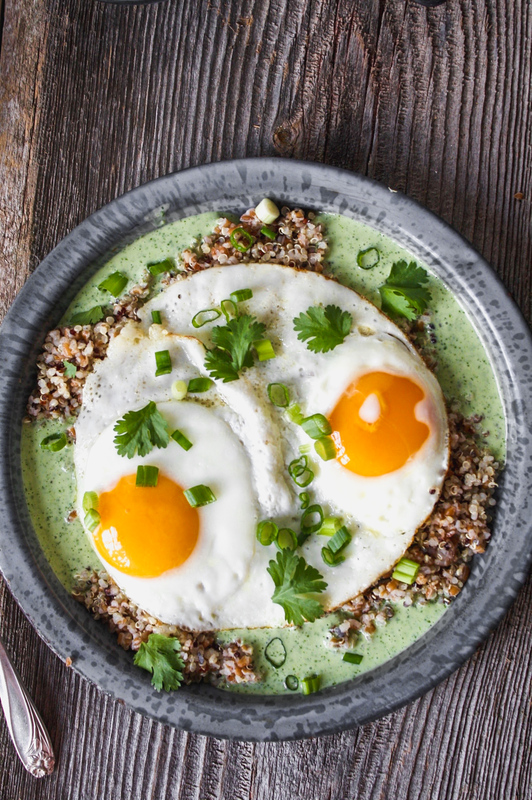 Sunny side up eggs set atop a bed of simply seasoned grains and pools of light green yogurt sauce. 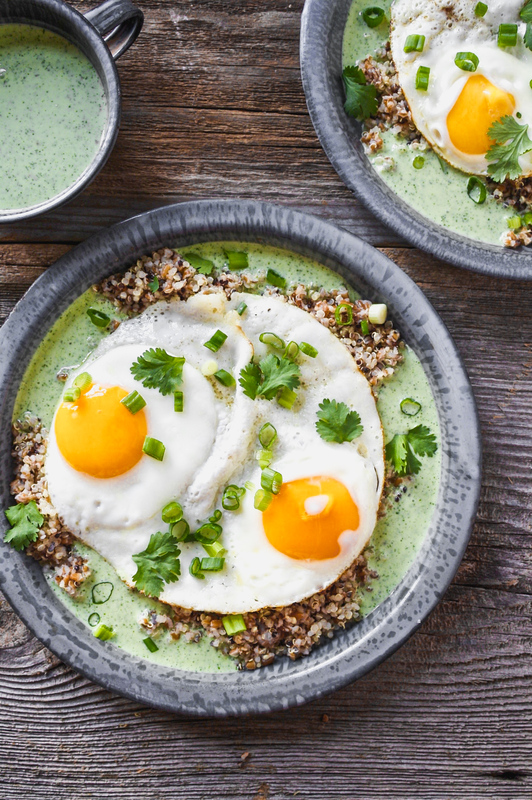 The ingredient list is simple, but the flavors come together to create a refreshing and healthy dish that’s perfect for starting off the day. Purée yogurt, cilantro, lime juice, coriander, and red pepper flakes in a food processor until smooth; season with salt and black pepper. Heat a large nonstick skillet over medium-low. Add 1 teaspoon butter and swirl around the pan to coat until melted and no foam remains. Crack 2–3 eggs into the pan, cover, and cook until desired doneness, 2–3 minutes. Transfer eggs to a plate and repeat with remaining eggs. Combine quinoa, bulgur, and olive oil; season with salt and pepper. 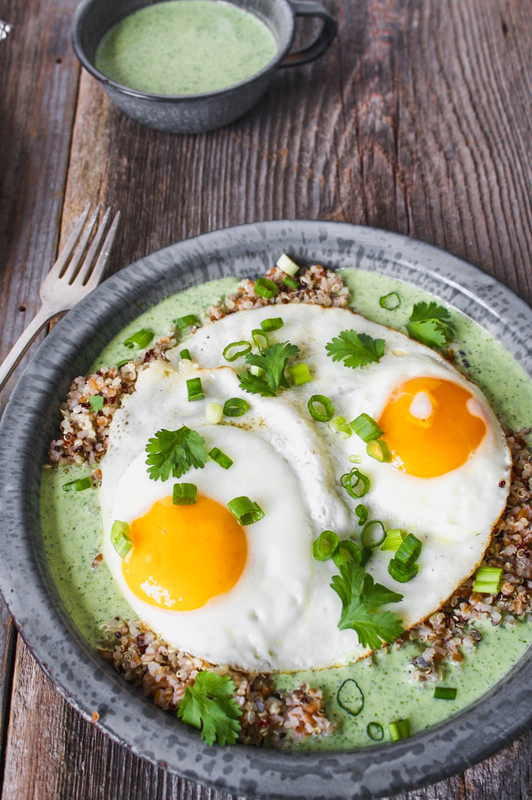 Divide quinoa mixture between serving plates, pour yogurt sauce around edges and top with eggs. Garnish servings with cilantro and green onions.